Two of the four towers of the cathedral of Bamberg illuminated by warm morning light seen from cathedral square (Domplatz). 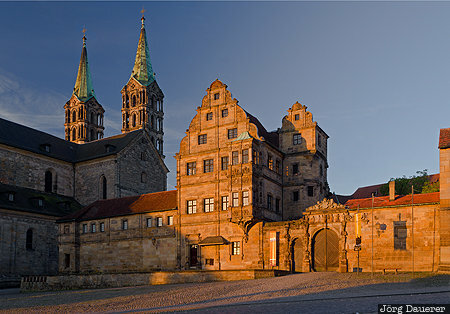 Bamberg is in Upper Franconia (Oberfranken) in the north of Bavaria, Germany. This photo was taken in the morning of a sunny day in September of 2012. This photo was taken with a digital camera.